The Gaslight Anthem are a band that hardly needs an introduction. Nearly everything you need to know about the New Jersey natives, from an eclectic sound that references every era of rock and roll to frontman Brian Fallon’s vivid, confessional lyrics, can be found on their four full-length albums. I say “nearly” because there are always songs that slip through the cracks. 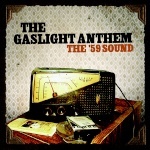 In The Gaslight Anthem’s case, those songs have been collected on The B-Sides, which compiles a handful of live recordings and studio cuts from the band’s tenure on SideOneDummy Records. The live acoustic tracks found on The B-Sides are definitely nonessential for the casual Gaslight Anthem fan. They make for a nice listen, and Fallon occasionally plays with the melodies in interesting ways, but they’re far from the definitive versions of these songs. “The ’59 Sound” and “Great Expectations,” for instance, merely plod along without the fiery drive provided by the other three band members, and the performance of “Boxer” pales in comparison to the version found on the group’s iTunes Session EP. The highlight of the acoustic portion of The B-Sides is a cover of Fake Problems’ “Songs For Teenagers.” The track originally appeared on a split with the Florida band, and Fallon’s interpretation just reaffirms how great of a song it is. The real meat of The B-Sides is in the studio recordings. “She Loves You” is an aching ballad that is up to par with nearly every track on American Slang, and they really cut loose on their rollicking cover of The Rolling Stones’ classic, “Tumbling Dice.” The latter is a reminder of just how much fun The Gaslight Anthem can be. The B-Sides closes with “Once Upon a Time,” a ’59 Sound-era cover of a Robert Bradley tune that exemplifies why B-sides records are important. The song never would have fit on the album with which it was recorded – it’s a cover and it’s far more reserved than the rest of the record – but it’s an excellent performance nonetheless. It would be a shame if songs like that lived only in the hard drives of those fans who put the extra effort into seeking them out. The B-Sides seems to function primarily as a way to get these songs to Gaslight Anthem fans who don’t own the recent Singles Collection or the original pressings of those records, and I certainly won’t fault them for that. Fallon and company are great musicians, and I want as much of their music in as many hands as possible. For a diehard fan who has been listening to these tracks for years, however, The B-Sides offers little in the way of incentives for purchasing outside of maintaining a complete collection.